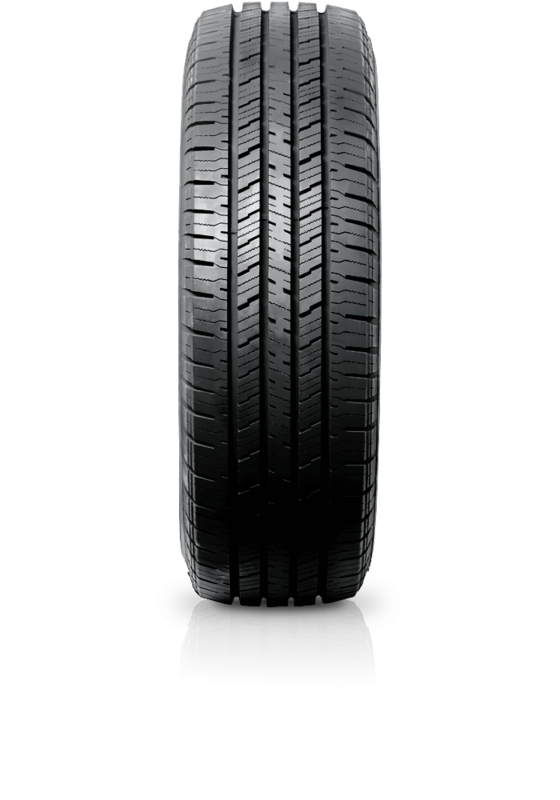 Hankook Dynapro HT RH12 is a premium on-road tyre for light commercial vehicles and SUVs. Hankook Dynapro HT RH12 is a premium on-road tyre for light commercial vehicles and SUVs. Dynapro HT tyres are designed to combine long treadwear, good ride comfort and all-season traction, even in light snow. Dynapro HT tyres feature a computer generated symmetric tread design that promotes even wear, low noise and all-season traction. Stable shoulders aid steering response while lateral notches increase traction in wet and wintry conditions. Independent intermediate tread blocks feature an interlocking geometry that allows them to generate traction in rain and snow while preserving block stability for handling. A high-stiffness continuous centre rib enhances steering response and straight-line tracking. Four circumferential grooves help channel water to resist hydroplaning and help maintain wet traction, while zigzag sipes located across the tread design increase the number of biting edges to improve winter time traction.